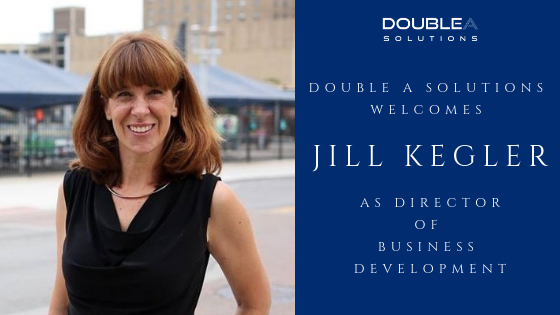 Double A Solutions is pleased to announce that Jill Kegler will be joining their team as Director of Business Development. As the director, she will be working on product development, new market penetration, marketing, and public relations for their Janitorial Manager software. She will also be assisting with their other software platforms: Blitz Sales Software and Call Logic. Jill began her career in 1992 with Kellermeyer Company. She started as an outside sales person and was named President in 2005. Under her leadership, Kellermeyer experienced significant growth and implemented innovative programs to stay on the leading edge of the distribution industry. In 2014, the owners of Kellermeyer sold to Nichols Paper. She worked with Nichols to ensure a smooth transition for customers, employees, and other stakeholders. In 2017, Jill chose to leave the industry and pursue a different opportunity. She attained her Real Estate license and focused on bringing her years of business skills and marketing knowledge to help clients in all aspects of buying and selling their homes. At the end of 2018, Double A Solutions reached out to Jill for insight on their Janitorial Manager software. She attended ISSA 2018 with them as a consultant and accepted an offer from Double A Solutions to become their Director of Business Development upon returning. When Double A Solutions asked me to join them, it was a no-brainer to say yes. I get to spend time in an industry I love and work with a fantastic company that brings creative solutions to a wide variety of businesses. Double A Solutions, LLC is a holding company that invests in and operates software and software-as-a-service companies that generate enough profits to enable investments to occur without the need for lines of credit and/or other equity partners. Their portfolio includes: Blitz Sales Software, a web-based software for tracking and accessing all of a company’s customers, leads, referrals, and past customers; Call Logic, a Cloud-Based (TCPA Compliant) outbound phone technology used in multiple industries to increase calling efficiency; Janitorial Manager, a cloud-based management tool that allows businesses to instantly bid jobs with ISSA cleaning times, communicate with customers, see what employees are doing and where they are, track performance, and gain live-time insight into inspections, inventory, scheduling, work orders, and operations. Double A Solutions also hosts a variety of other SaaS programs and offers custom software development as well.